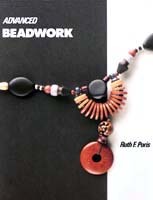 Advanced Beadwork is a clearly written exploration of all major beading techniques, including metal work and soldering. With more than 300 illustrations and photographs, this is an indispensable book for anyone interested in beadwork. Soft cover, 8.5" x 11", 148 pages. The Basics of Bead Stringing addresses the most common and popular questions of those who would like to begin designing and producing their own jewelry. 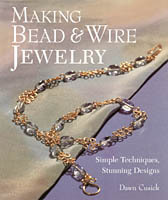 Basic bead stringing and wire wrapping techniques are demonstrated step-by-step. Soft cover, 5.5" x 8.5", 82 pages. 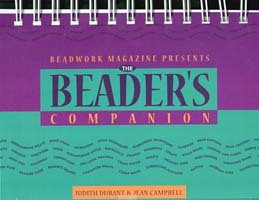 The Beader's Companion is compact, sturdy and easy to read, filled with definitions and illustrations of techniques, beads and tools. This book provides basic step-by-step information. Covered are types of beads, bead glass finishes, bead sizing, thread and cord, waxes and conditioners, needles, off-loom stitches, loom techniques, stringing beads, embroidery techniques, knitting with beads, crochet with beads, macreme, findings, wirework, and finishing. Soft cover, 7" x 5.5", 104 pages. Beads The Art of Stringing is the most inexpensive guide available that describes the invaluable techniques of knotting in bead stringing. Step-by-step instructions explain knotting between beads using your fingers, a beading awl, or "tee pin", or the double needle method. Materials you will need to get started are described in detail. Techniques in stringing and knotting are explained with easy-to-understand text and illustrations for the beginner. Soft cover, 5.5" x 8.5", 58 pages. Learn to manipulate hot glass to make beautiful flameworked shapes and objects that you'll assemble into larger sculptural and functional pieces. 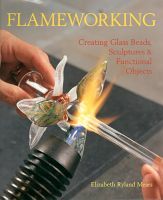 These techniques are the most accessible way to begin working with hot glass and are fully explained in this groundbreaking book. If you already have some experience, you'll find many new flameworking techniques with which to express your artistic vision. The detailed and easy to follow exercises, brought to life by sophisticated projects, will enable you to build a series of skill with each one you complete. Contents include Introduction, Glass Basics, Setting Up Your Studio, Healing "Devit," Creases and Cracks, Color, Glorious color!, Glass Rods and Tubing, Making Gathers, Experimenting with Gravity and Fusing Rods, making a Leaf and Variations, Embellishing Leaves, Making Marias and Transitional Shapes, Casing a Clear rod with Color, Making a Heart Shape, Making a Fish Shape with Frit Color, Making A Flower, Making Icicles with Stripes, Working with Tubing and Making a Candle holder. Projects include Versatile Plant Stakes, Flowers with Leaves and Stems, Colorful Suncatcher, Kinetic Mobile Leaf, Candlestick with Transitional Shapes, Decorative Glass Candies, Beads as Glass Sculpture, Tall Candlestick with Fish Motif, Heart Wall Sculpture, Flower Candleholder and Fish Sculpture. Hard Cover, 9" x 10.5", 174 pages. Use beads and wire imaginatively to make the most fabulous jewelry, including earrings, necklaces, bracelets, pendants, and eyeglass chains. It's easier now than ever before with the incredible range of readily available bead-making supplies, color-tinted wire that gives you a whole new palette of choices, and specialty wire that was previously available only to professionals. Try your hand at making a wire wrap choker, teal coils hair clip, evergreen wire and crystal beads necklace, caged beads bracelet, gemstone pendants, dancing bead people earrings, pins and pendants, bead flower choker and earrings and many more projects. A bonus feature is more than 30 patterns to use with a jig to create lovely wire links. Soft cover, 8.5" x 10", 128 pages. You can create genuine precious and semiprecious, high fashion jewelry for a fraction of their retail cost or simply learn to restring your own pearls and beads just like professionals do. Adapted from her successful craft series, Henrietta shows you step-by-step different techniques of knotting beads, including finger knotting. You'll learn the sources for materials and how to get started in your own business plus a whole lot more. A wealth of information for the beginner as well as the more advanced. Soft cover, 5.5" x 8.5", 78 pages. Step-by-Step Bead Stringing provides a starting point for learning the basic skills of stringing and restringing beads. The instructions explain all the basic techniques for working with beads from simple inexpensive wood, plastic or glass to precious gemstones and pearls. The instructions are fully illustrated and may be followed step-by-step. Soft cover, 5.5" x 8.5", 45 pages.